Lovely Moon one day after Full phase. The great comet Wirtanen was almost completely washed out due to the interfering Moon, so I had to do “only” with our satellite. Which had its own beauty high up in the cold winter sky. Great care was taken while processing this image. 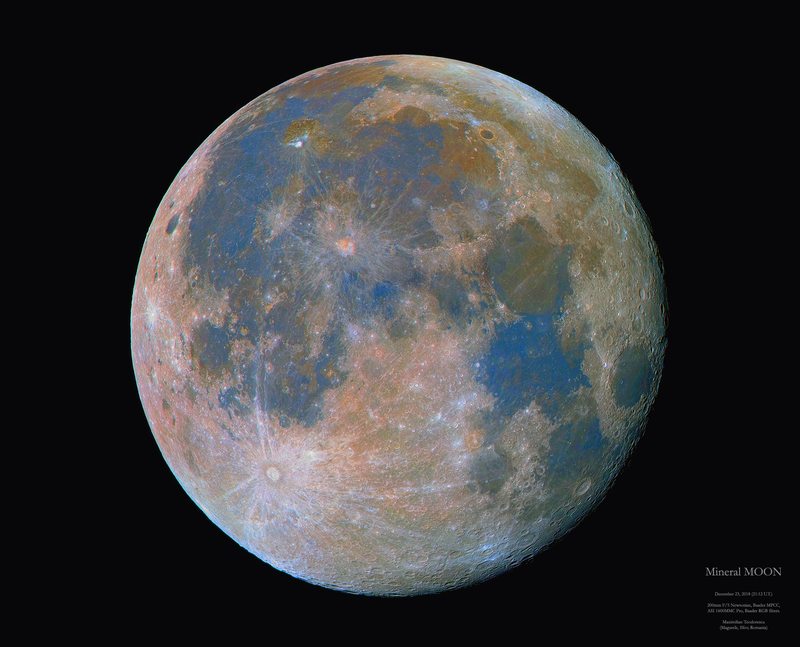 I believe it is my best and correct processing of a mineral color Moon. Using a reflector helped a lot, with no chromatic aberrations. Tech details: December 23, 2018 (21:12 U.T.) 200mm F/5 Newtonian, Baader MPCC, ASI 1600MMC Pro, Baader RGB filters. 2000 frames for each channel. Processing in AutoStakkert!3, AstraImage and Photoshop. And some views of comet Wirtanen, almost washed out completely due to the Moon. Just a hint of the tail is visible on the Larson-Sekanina processing (Inset). The movement of the comet is around 8 arcsec per minute. This entry was posted on December 24, 2018 at 03:19 and is filed under ASTRO. You can follow any responses to this entry through the RSS 2.0 feed. You can leave a response, or trackback from your own site.